Kodai Djinns – The Yo-yo Meets Tamagotchi | OhGizmo! I don’t think the Yo-yo was ever considered to be a cool toy. While it’s neat to watch someone with impressive yo-yo skills, very rarely will you walk away wishing that could be you. In an attempt to convince todays kids that Yo-yos are cool, Kodai Djinns has merged the classing spinning toy with electronic gaming. 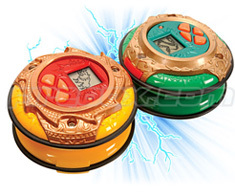 The yo-yos are equipped with a small LCD screen and red, yellow or blue LEDs that flash as you spin it. When you first start playing with the yo-yo your warrior is ‘born’ and as you continue to spin it you’ll slowly charge your warrior’s skills. When sufficiently charged (you’ll know thanks to built-in sound effects) you’ll be able to play one of 7 different games VIA the LCD screen. You can even battle with another Kodai yo-yo wirelessly over infra-red. The Kodai Djinns Yo-yo is available from Firebox.com for $26.00 or in a double-pack for $48.70.